I received an email last week asking me for some personal tips on how to paint straight lines using a stripping nail art brush. Most nail artists would probably say that it is best practice to move your nails instead of the brush when painting lines. I agree. I was composing my reply with this suggestion until I realized that perhaps it is better to tell her to use shortcomings to create beautiful nail art. We all have our strengths and weaknesses. We cannot let the latter bring us down, right? And so here I am sharing with you a hand-painted nail art wherein straight lines were not welcomed. I fondly titled this -- I Can't Draw a Straight Line. The design was quite easy to do since I only needed to worry about the spacing between each crooked line. Other than that, I let the nail art brush do the talking ... I mean, its thing. 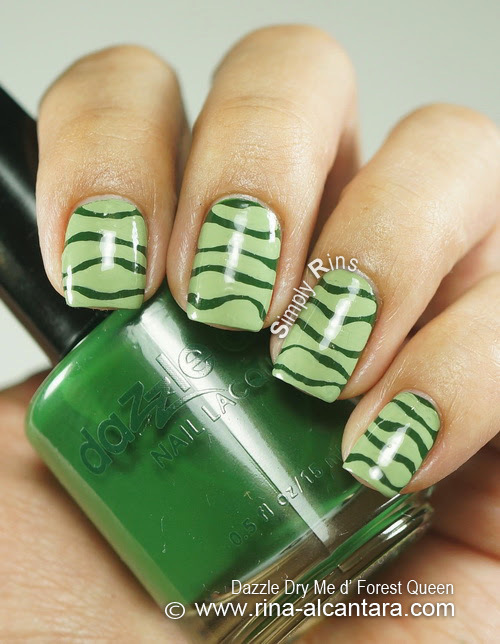 I was wearing Dazzle Dry Me d' Forest Queen when I read the email so I decided to use it as base for this nail art. I used 2 coats for complete coverage. (Swatched and reviewed here.) I'm not sure if you will agree but I'm liking green on my skintone. Instead of a stripping nail art brush, I used a fine brush because I wanted to do thicker lines. But go ahead and use a stripping nail art brush if you are more comfortable with it. I also decided to use a not so bright green acrylic paint so that the base color will still play a part on how the nail design will look. White is a good alternative but I prefer this ombre look. I recommend making sure that the acrylic paint you use/mix is opaque so that you don't have to go over the lines several times. At least twice is best. And don't worry about how each line will look since they're supposed to be crooked. This looks like an animal print. But what animal? It also reminds me of camouflage (sort of) but it isn't. Nevertheless, I like the look because it's simple and very wearable. I might do another one but with rainbow colors. I think that would be a fun manicure. Oh, and make sure you cap the nail tips if you're painting on the free edge to limit chipping. As a personal practice, I apply a good amount of top coat on the tips when I do designs like this so that the acrylic paint will not peel easily. 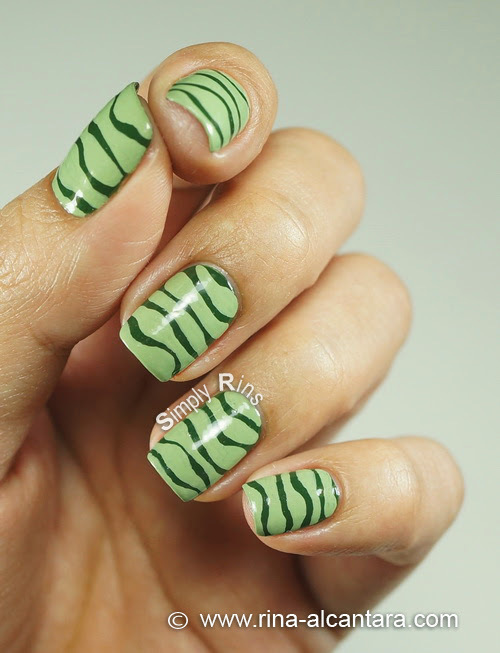 If you are a nail art beginner, you might want to consider this design for practice. I hate painting straight lines. My tips are to get the right brush and work with the right paint for that brush. So gorgeous! It reminds me of camouflage too!